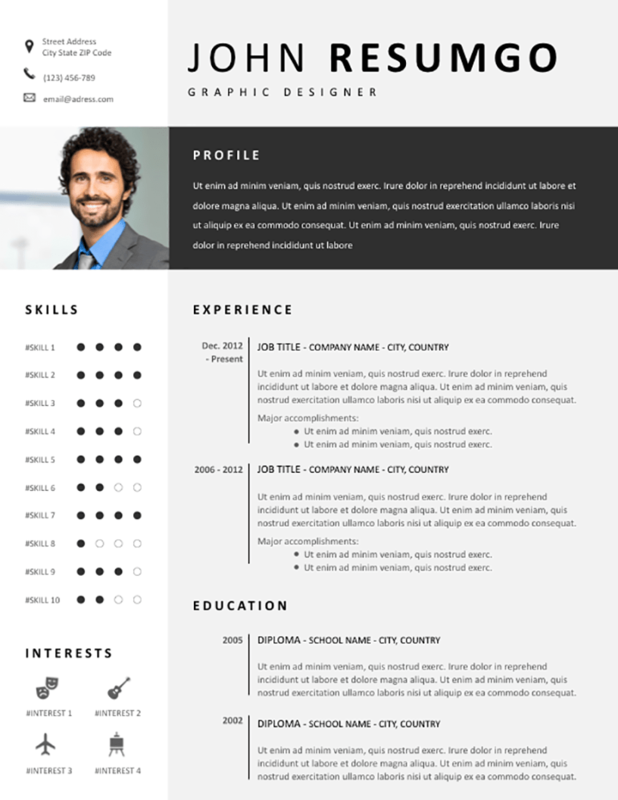 Fotis is a modern resume template with a light gray background and dark elements. 2-column layout. This CV template has a clear structure, with 2 vertical parts. The first white background column, on left, contains your personal information on top, your square ID photo, your skills (4-point/dot rating scale) and interests (icons). The main right column uses a gray background. The first 2 parts are perfectly aligned with elements of the first column: your name and job title are at the same level as the personal information, and your custom profile/objectives statement (in a dark gray banner) mirrors your ID photo. Then, your professional experience and education are clearly presented, with the dates having their own separate column.